Is the art of making financial predictions similar to forecasting the weather? One hundred years ago weather forecasting was in its infancy and it was difficult to predict the weather from one day to the next. Weather maps were limited by input data and only a few people may have owned barometers and could tell if the pressure was rising or falling. Gradually the world became more connected via the telegraph, and data could be collected from a few remote locations and the first crude weather maps could be created. However, data for temperatures and pressures over the vast expanses of ocean was still missing from early maps, save for a few radio contacts from shipping, and we know that weather patterns at sea strongly influence what happens on land. Today there is a plethora of data from satellites, aircraft, shipping traffic and automated weather beacons. Even a non expert who sees an animated weather map of the last few days can see whether a storm front or hurricane is heading in their general direction, or in the case of California, if a high pressure ridge is blocking all moisture from ever reaching the state again. So where are the equivalents of weather maps for the economy and the financial markets? Why can’t we make global or even local maps of money flowing around in our economy? Wouldn’t it be instructive to graphically see which market sectors were in the doldrums and which parts of the economy might be overheating? 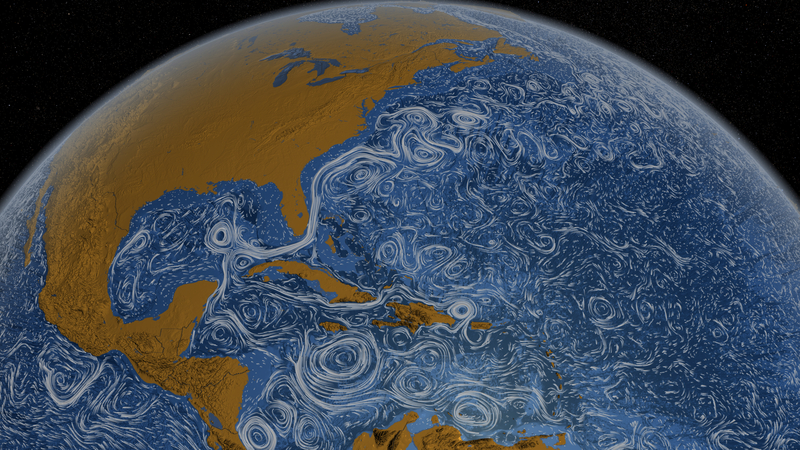 In the image at the top of this article NASA scientists have mapped out the world’s ocean currents. We can discern deep and stable flows which carry heat energy to northern latitudes. We also see how turbulence causes eddies to spin off from the main flow, and over time we see which flows are constant and which are subject to seasonal fluctuations. By comparison, it seems economic forecasting today is where weather forecasting was 100 years ago, still using chicken bones and the color of sunsets to to tell us the behavior of stock markets tomorrow. Weather forecasting improved when reliable data could be recorded and mapped from around the globe. Market forecasting needs global economic data from every sector. It’s interesting to speculate what data needs to be plotted on a global map: the speed of money (e.g. the volume of shares per day) is an important factor, but also the direction its going (e.g. how much goes from the transportation sector to the energy sector). Imagine seeing a map of the flow between the US and Chinese economies! It’s not rocket science. You don’t have to be NASA to record financial transactions to make a giant map. The data is out there, it just needs to be mined to extract and present the data in the correct graphical way for everyone to see and intuitively understand. Coincidentally, an article in WSJ just announced an initiative dubbed “SPReD”, which stands for Securities Product Reference Data, in which J.P. Morgan, Goldman Sachs, Morgan Stanley are to form a data company. Maybe they have a similar purpose in mind, but I can’t imagine that they’re going to share the insight they gain with everyone. On the other hand, data mining on this scale is also Google’s area of expertise. The daily price of shares and the volume traded is already tracked on Google Finance. Even the derivatives of these quantities are available in terms of the number of daily puts and gets on these stocks. Let’s throw down a Google gauntlet and ask why can’t the Google analytic’s team crunch the numbers and display the flow of capital in a more digestible, graphical way. Large scale data analysis is also something we can crowd source. I’m sure many of you have ideas and opinions of what can and cannot be recorded and mapped. The economy is changing with the democratization of the market with firms like Uber and Airbnb. The next big step in this democratization movement is making market data more readily available and displaying it in a more profound way than merely plotting the DOW Index rising and falling each day. Let’s hear from you. 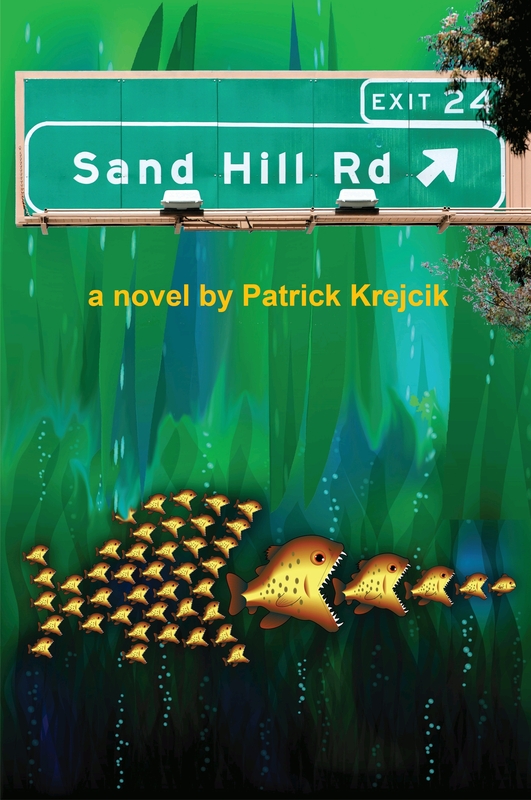 Patrick Krejcik is a physicist at the SLAC National Accelerator Laboratory on Sand Hill Road, Menlo Park, California, and also author of the novel Sand Hill Road in which the protagonist is a physicist entering the world of venture capital for the first time. There was a time when financial analysts, quants, were recruited from high energy physics labs and university maths departments. Physicists were trained in analyzing large data sets and picking trends out of the noise. Why not recruit hungry physicists fresh from the hunt for quarks and Higgs Bosons into the world of stock market predictions? But then came the stock market crash, the bubble burst and quants became a dirty word. They should have been able to predict the crash with access to all that data and computing power, so what went wrong? Chaos in the stock market is a lesson we are doomed to repeat. Every time the stock market recovers a new algorithm is formulated and high speed trading takes over. The perils of the next crash are ignored because we are drawn like moths to a flame in the belief that fortunes can be made by predicting short term trends in market behavior. Benoit Mandelbrot developed a new mathematics to characterize chaos theory in his 1982 book The Fractal Geometry of Nature. The same mathematics that could describe jagged mountain ranges, he discovered, could also describe the precipitous price changes on the stock market. He followed up with another book in 2004, The (Mis)behavior of Markets: A Fractal View of Financial Turbulencewhere he showed the shortcomings of present day economic models for market theory. entrepreneurial risks at the Swiss Federal Institute of Technology, famously predicted the 1994 stock market crash and showed that there was money to be made for some in short selling stocks. There’s gold in them thar fractal hills! He gave an illuminating TED Talk on how we can predict the next financial crisis. Predicting market swings tends to be proprietary information closely guarded by an elite few. After all, if everybody knew what was going to happen it would no longer allow the top fund managers to make a profit at the expense of the remainder of the market. It is sometimes better left to fiction to describe the ‘what-if’ scenarios in such a high stakes game. In the novel Sand Hill Road a mathematical physicist does come up with an algorithm for predicting market turbulence and making market maps of the whirlpools and eddies in the flow of money. The reaction of the venture capital world to his discovery may not be what you think when they are less than welcoming to his ideas. The action takes place on the famous center for venture capital from which the novel gets its name – and referred to by some as ‘the Wall Street of the West Coast’. It’s a very different lifestyle from Manhattan and gives a distinctively Californian flavor to the novel when the Stanford physicist is pitted against the magnates of the financial world. Mention the words accelerator specialist on Sand Hill Road and you’ll likely get very different responses depending on which side of the road you’re standing on. On the venture capital side it will automatically be assumed you mentor small companies and guide them from the startup phase through to IPO, and if you do it right the end result could be worth billions. On the opposite side of Sand Hill Road is the SLAC National Accelerator Laboratory where an accelerator specialist is someone who builds the monster machines designed for whizzing subatomic particles up to light speeds and smashing them together. But does a laboratory boasting over 50 years of Nobel Prize winning physics research with accelerators have anything in common with its ‘upstart’ venture capital neighbors on Sand Hill Road? The answer is an emphatic yes, even though at first glance the two cultures seem vastly different. At SLAC the government funded researchers can be seen passing through the front gates at all hours, driving perhaps a modest Subaru or pickup truck, while their neighbors cruise past behind the darkened windows of German and Italian luxury sedans. On Friday afternoons while the VC crowd gathers at the Rosewood to sip on $20 drinks the SLAC engineers are more likely to head to the Dutch Goose for a pitcher of beer and the free peanuts. The livelihood of both cultures, though, relies on innovation and risk taking. It may take years to build a new and bigger machine at SLAC, coaxing it to operate at new frontiers of discovery. The challenge to venture capital is to provide sufficient support for an emerging technology, nurturing it and creating a product in the process that will generate a whole new market where none even existed before. George Doriot is the acknowledged father of venture capital after his initial $70,000 investment in Digital Equipment Corporation in 1957 earned him $355 million when the company went public in 1968. During that same era physicists in the Hansen Lab on the Stanford campus were proposing Project ‘M’, for monster. The Stanford Linear ACcelerator became the world’s largest linear accelerator at two miles long, and has yielded countless scientific discoveries. In the meantime Sand Hill Road has grown up to become the new Wall Street of the West Coast, where the cost of office space per square foot is now the highest in the nation. If you want to be in the venture capital game you have to have an address on Sand Hill Road. Stanford encouraged its engineers and scientists to take their ideas and inventions out into the market place and actively facilitated the investment in those ideas. The result, of course has been the resounding success of Silicon Valley, so it is no surprise that a world class accelerator physics laboratory lives side by side with the investors and incubators of new technology. The disparity in lifestyle between the well-heeled VC crowd and the more academically inclined researchers at SLAC may occasionally raise eyebrows, but as a side note it does provide a wonderfully rich setting for creating fictional stories about Sand Hill Road, which you can also find here. So the next time you’re in either the Rosewood or the Dutch Goose try asking someone what they know about accelerators. You may be surprised by the answer. Chaos grips Silicon Valley’s largest venture capital firms as a financial collapse looms. Enter Massimo, a physicist at Stanford’s accelerator lab on Sand Hill Road. Using a formula originally developed for high energy physics for predicting chaos he discovers he can successfully forecast stock market trends. Abruptly, he is swept up in a maelstrom of events as his fledgling startup company is seized in a series of convoluted mergers, involving the largest venture capital firms on Sand Hill Road. Aware of the disturbing applications his formula may be used for, he tries to follow the oblique money trail of his new angel investors, but is utterly unprepared for the gold rush mentality of Silicon Valley Enterprise. Can the physicist match wits with the shrewd VC’s? Massimo’s fatalistic urge to prove his theory for predicting chaos may be his demise as he seeks to expose the mastermind behind the impending banking scandal that dwarfs even the excesses of Wall Street.